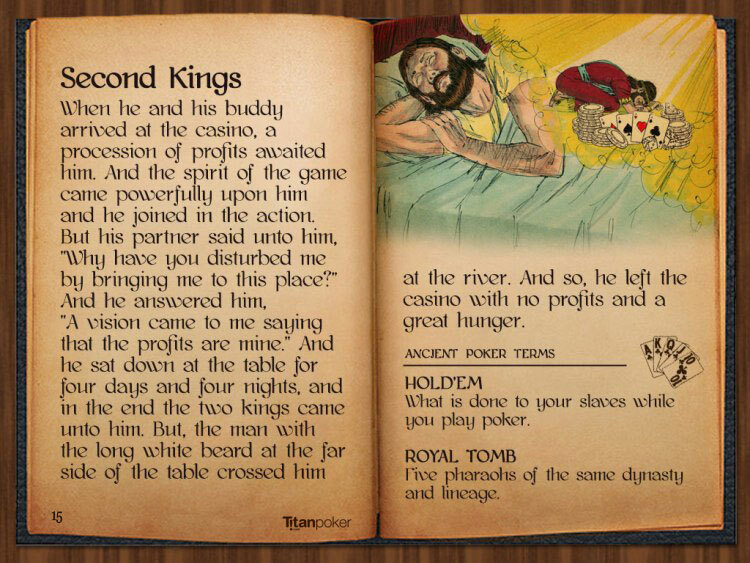 Poker and the Bible, a holy card connection. 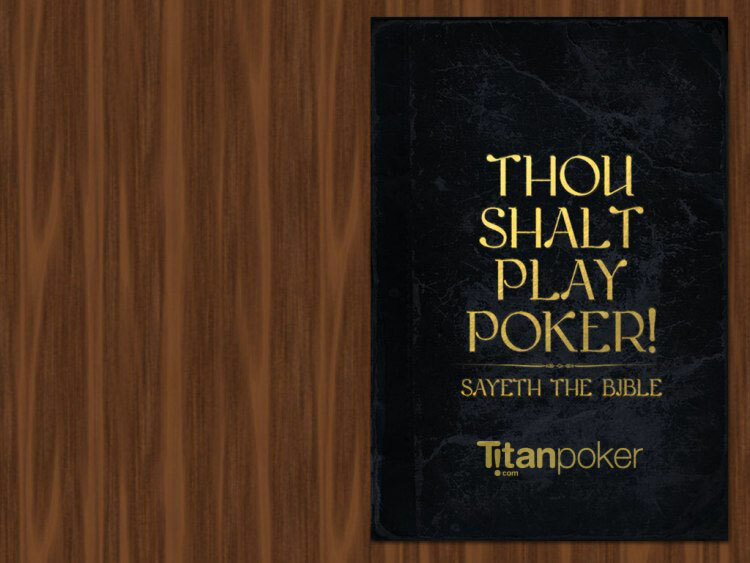 The Poker Bible is full of sacred poker phrases, all of them originating in Biblical times. Many people think that Poker evolved into the game as we know it only in the last 150 years, but in reality, Poker is a very ancient game. The patriarchs played Poker, as did the pharaohs of Egypt. 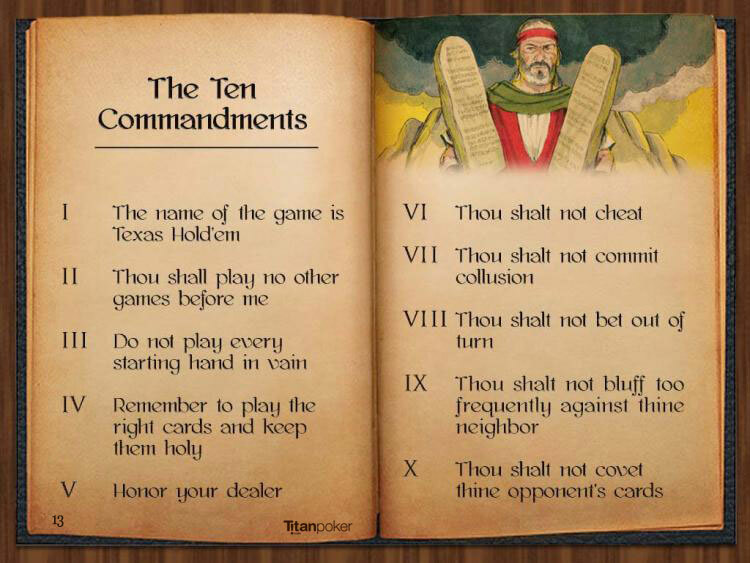 The Poker Commandments have been guiding poker players for thousands of years. 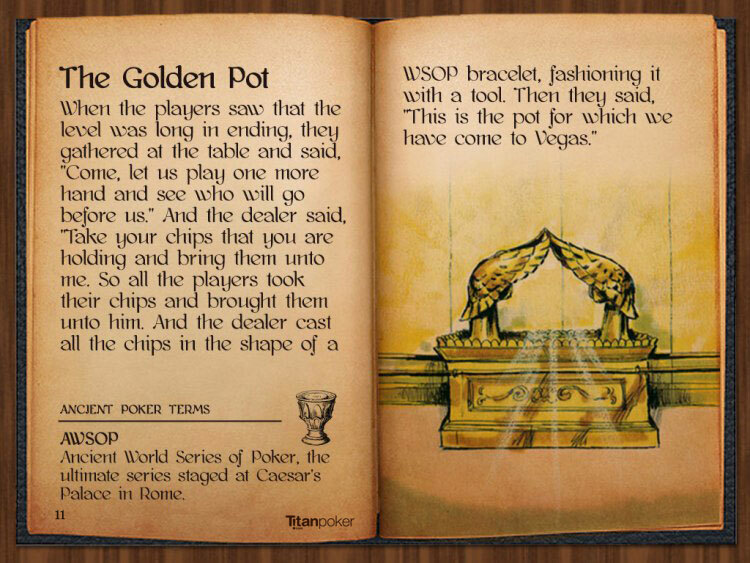 We've translated the ancient poker scripts and transcribed the poker gospel. If you believe in Poker, you will be saved! 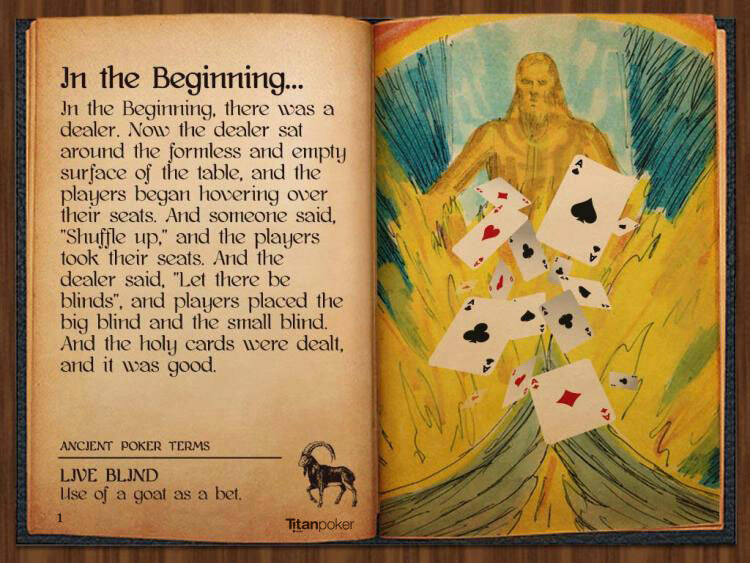 Now read the Poker Bible, or ye shall perish. In the Beginning, there was a dealer. Now the dealer sat around the formless and empty surface of the table, and the players began hovering over their seats. And someone said, "Shuffle up," and the players took their seats. And the dealer said, "Let there be blinds", and players placed the big blind and the small blind. And the holy cards were dealt, and it was good. 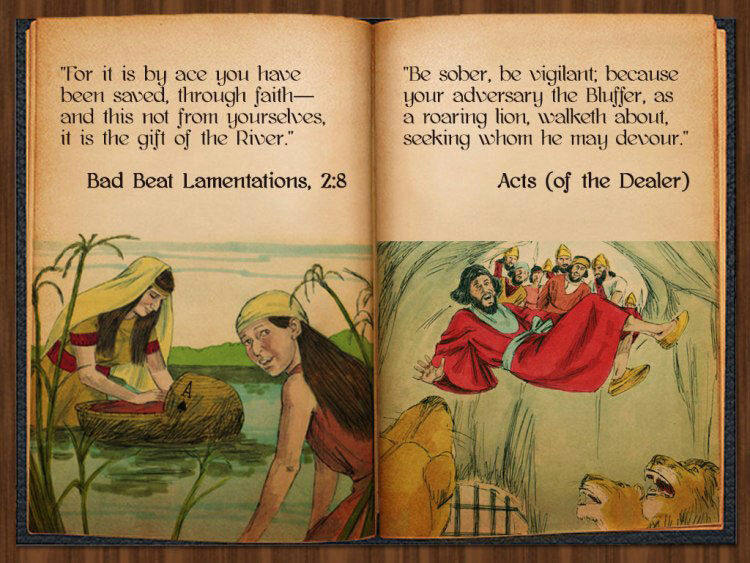 "For it is by ace you have been saved, through faith—and this not from yourselves, it is the gift of the River." "Be sober, be vigilant; because your adversary the Bluffer, as a roaring lion, walketh about, seeking whom he may devour." In those days there were two poker playing brothers who lived together in the Garden of Eden Casino Resort Tent. 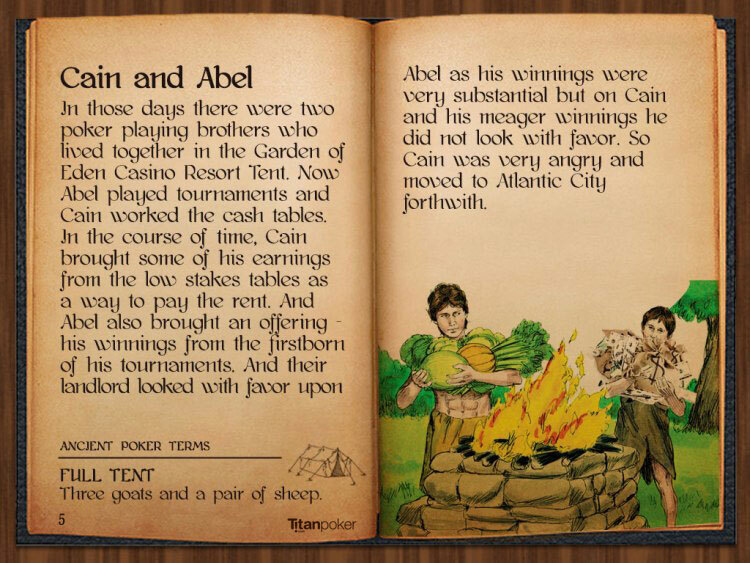 Now Abel played tournaments and Cain worked the cash tables. In the course of time, Cain brought some of his earnings from the low stakes tables as a way to pay the rent. And Abel also brought an offering - his winnings from the firstborn of his tournaments. And their landlord looked with favor upon Abel as his winnings were very substantial but on Cain and his meager winnings he did not look with favor. So Cain was very angry and moved to Atlantic City forthwith. This is the account of Noah, a simple poker player and his family. Noah was an honest player, blameless among the people of his time. 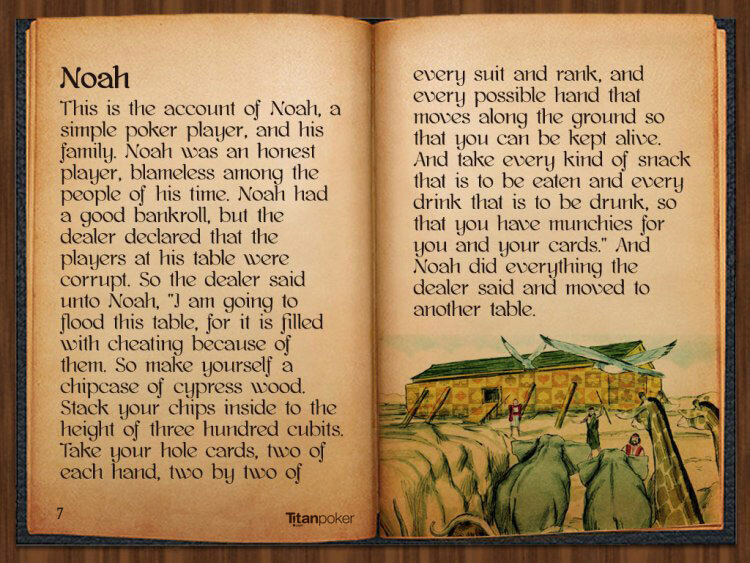 Noah had a good bankroll, but the dealer declared that the players at his table were corrupt. So the dealer said unto Noah, "I am going to flood this table, for it is filled with cheating because of them. So make yourself a chipcase of cypress wood. Stack your chips inside to the height of three hundred cubits. Take your hole cards, two of each hand, two by two of every suit and rank, and every possible hand that moves along the ground so that you can be kept alive. And take every kind of snack that is to be eaten and every drink that is to be drunk, so that you have munchies for you and your cards." And Noah did everything the dealer said and moved to another table. "Trust in the Flop with all thine heart." When the players saw that the level was long in ending, they gathered at the table and said, "Come, let us play one more hand and see who will go before us. And the dealer said, "Take your chips that you are holding and bring them unto me. So all the players took their chips and brought them unto him. And the dealer cast all the chips in the shape of a WSOP bracelet, fashioning it with a tool. Then they said, "This is the pot for which we have come to Vegas." When he and his buddy arrived at the casino, a procession of profits awaited him. And the spirit of the game came powerfully upon him and he joined in the action. But his partner said unto him, "Why have you disturbed me by bringing me to this place?" And he answered him, "A vision came to me saying that the profits are mine." And he sat down at the table for four days and four nights, and in the end the two kings came unto him. But, the man with the long white beard at the far side of the table crossed him at the river. And so, he left the casino with no profits and a great hunger. and David sacrificed burn cards and fellowship bluffs before them." 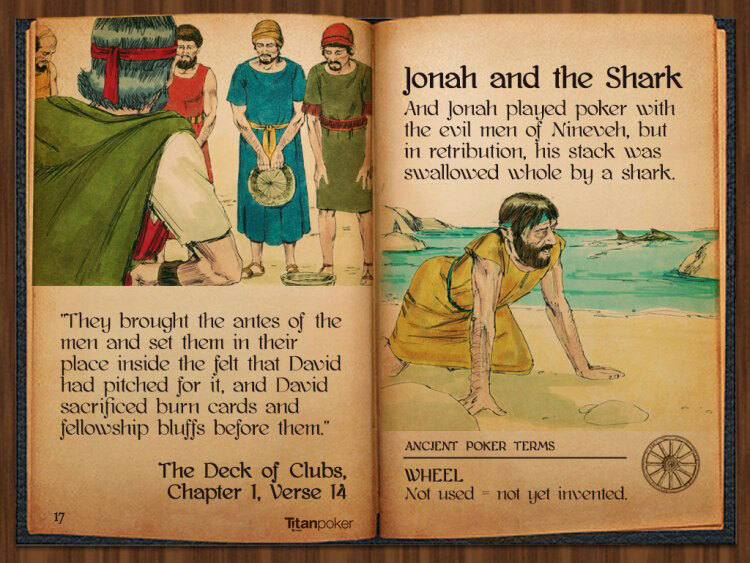 And Jonah played poker with the evil men of Nineveh, but in retribution, his stack was swallowed whole by a shark. 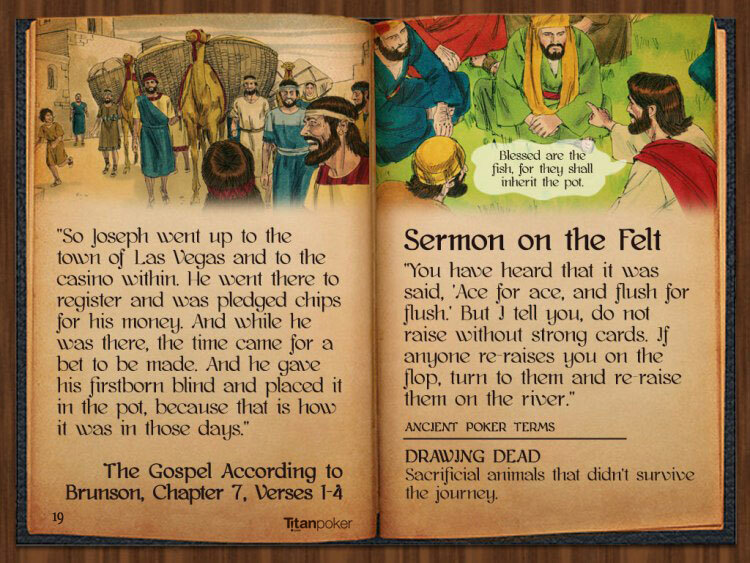 "So Joseph went up to the town of Las Vegas and to the casino within. He went there to register and was pledged chips for his money. And while he was there, the time came for a bet to be made. And he gave his firstborn blind and placed it in the pot, because that is how it was in those days." "You have heard that it was said, 'Ace for ace, and flush for flush.' But I tell you, do not raise without strong cards. If anyone re-raises you on the flop, turn to them and re-raise them on the river." "Blessed are the fish, for they shall inherit the pot." Moses said to the players, "Do not be afraid. Online Poker has come to test you, so that no fear of playing online will be with you to keep you from depositing." "Cursed be these aces, cracked by deuce seven again!" View all the slides in this article as a single picture here. 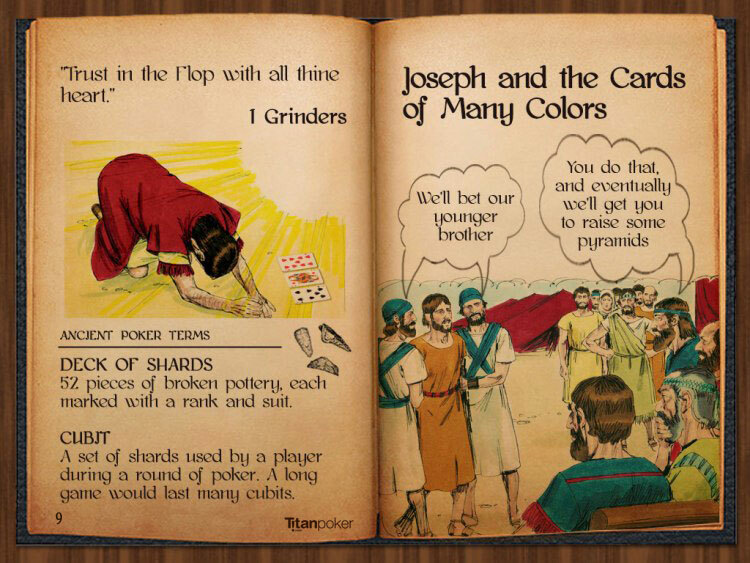 Get the entire Poker Bible PDF and starting praying, uh, we mean playing. 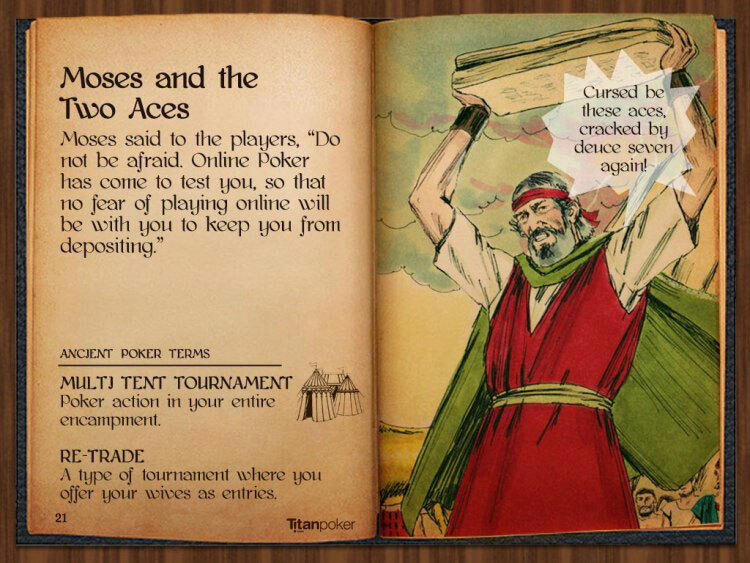 Titanpoker.com's Poker Bible is a humorous presentation connecting the world of the Bible with the game of poker. We have prepared this for entertainment purposes with no intention to question or harm the beliefs of the adherents of any religion. We apologize in advance if by any chance offense is taken with this presentation. 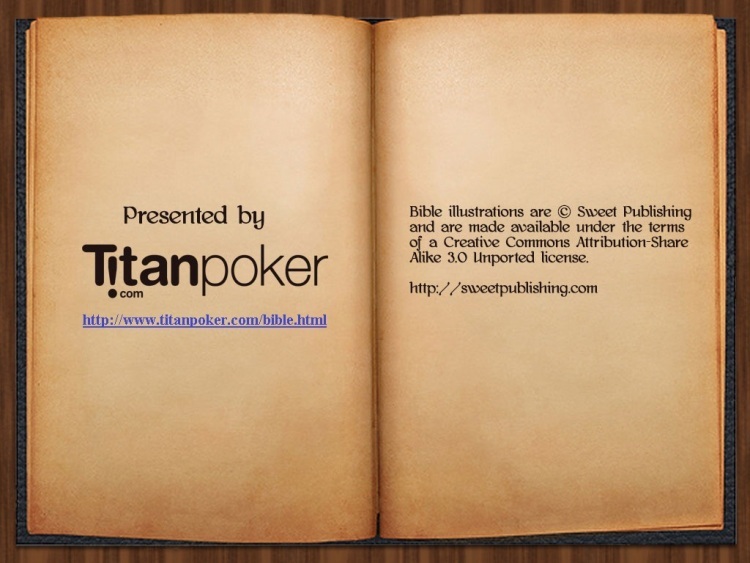 We thank Sweet Publishing for their original illustrations that have been adapted for the Poker Bible.